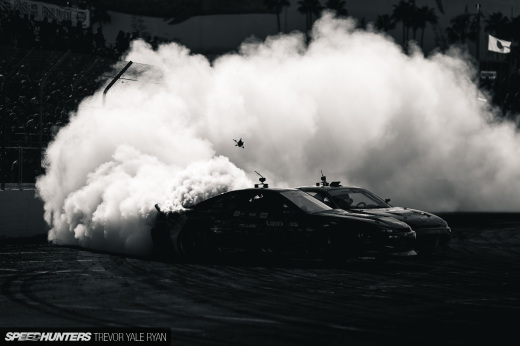 Over the course of the Formula D season, you have probably gotten used to Rod and Antonio's first hand reports as they traveled around the country to the different events on schedule. As you know though, they were not able to make it to last weekend's Seattle round as they were here in Japan instead. 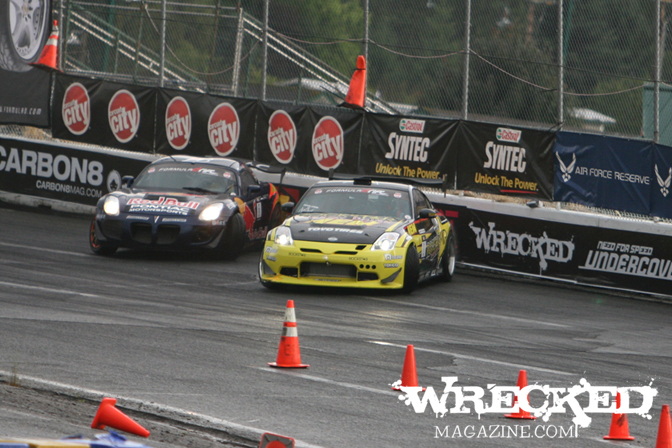 Luckily, we have event photos from our friends at Wrecked Magazine and though you probably already know the results, let's take a quick look at the photos. 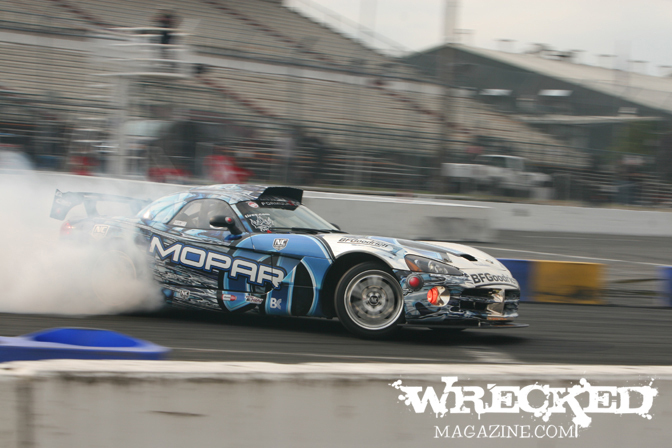 Tony Angelo's RX8 has to be one of the coolest cars in FD, look at that BN aero nearly dragging along the ground. Tony and his buddies recently had to vacate their SoCal home base which was fondly known as Camp Snakebite. A place that will go down in history for sure. 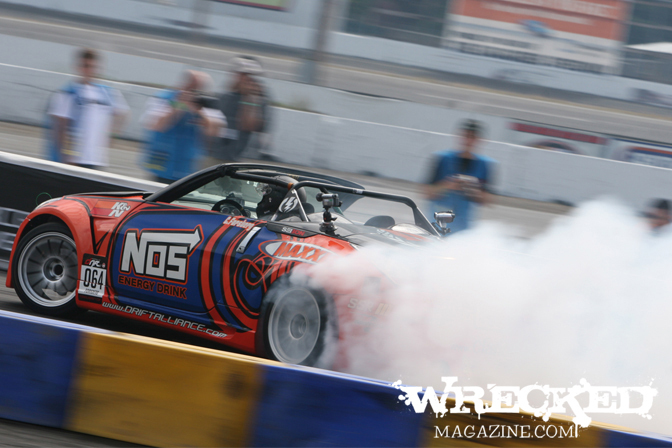 Here's Tony's Drift Alliance teammate Chris Forsberg laying down clouds of tire smoke in his V8-powered Z33 convertible. I can almost hear the roar of the exhaust which i fondly remember from the Ziptied All Star Bash events. There's Darren McNamara living the American Dream. Must be nice. 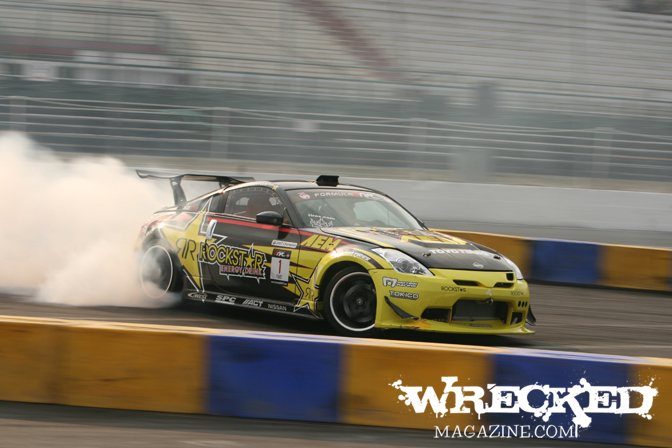 Here we see Tanner Foust's Z meeting up with the Takatori's Autobacs Skyline. Have to hand it to Takatori and the Super Autobacs team for doing so well this year despite the relatively small size of their operation. 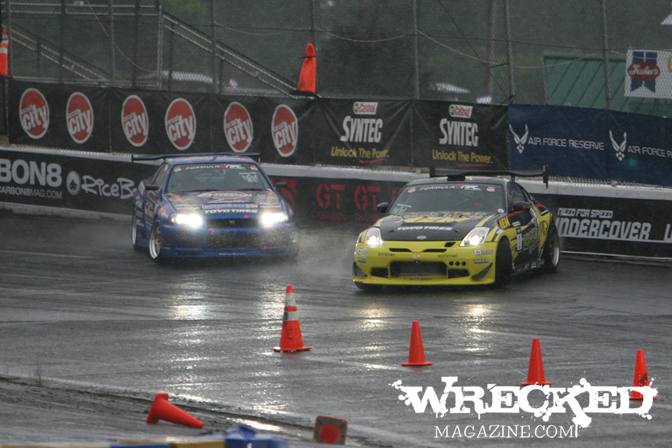 As you can see in this photo, the fans and drivers at Formula D Seattle got a nice taste of the Pacific Northwest's famous rainstorms. This midsummer rain reminds me of the summertime conditions here in Japan. Ah yes, Sam Hubinette's terminator Viper and its attention-grabbing chrome finish. 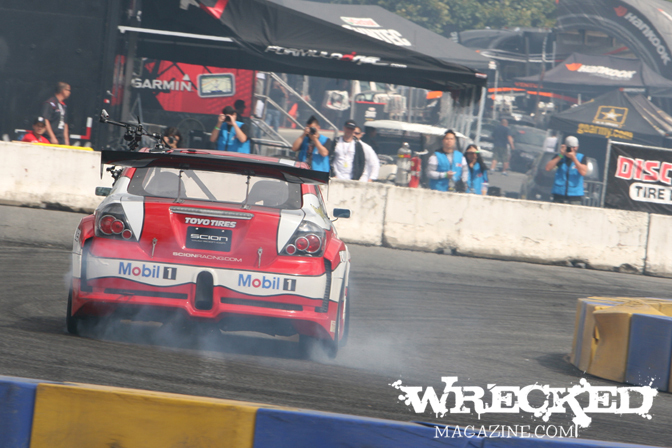 Nice rear view of Ken Gushi's Scion tC. I wonder if Ken and the team have gotten this car dialed in yet? I know they were having some machine issues earlier in this season but it looks like they may have it sorted it out now. 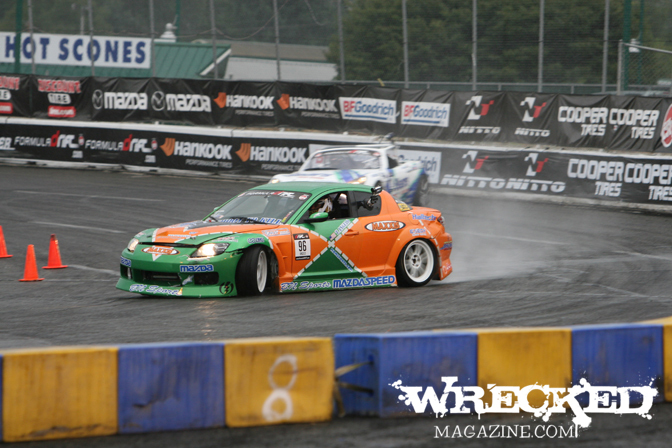 There's Tanner's Rockstar Z33. 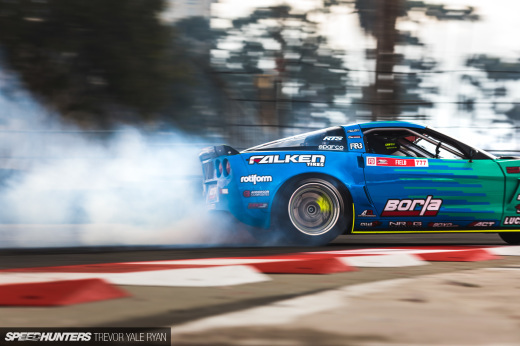 In the fall of last year,Tanner came to Japan to demo runs at the MSC finale in Tokyo after winning the Formula D title in the states. I wonder if any FD drivers will be coming again this fall? There's Tanner and Rhys battling it out late in the event. 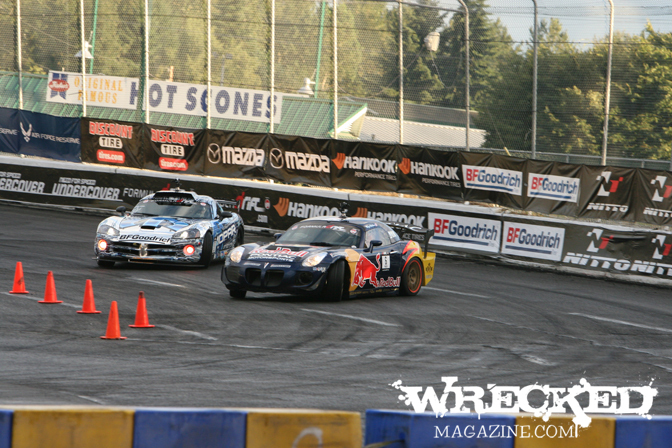 In rather unsurprising fashion, the final came down to a battle between Rhys Millen in his Solstice and his good friend Sam Hubinette in his Viper. These are the two guys that just happen to be the the most succesful drivers in the history of the series. In the end Rhys and his Red Bull Solstice would come home with the victory. Well that's it for now. Time to get ready to bed. Have to get up early because Rod, Antonio, and I are taking a road trip out to Honjo Circuit for the MSC event tomorrow. Here's hoping all of the gear will fit into our humble little Honda Fit. Otsukare sama deshita Mike, thanks for pulling an all nighter so you could post up the Wrecked Mag photos before picking us up in the morning. Awesome job man. How about pics of Robbie Nishida and his podium finish? He and Tyler are putting Hankook Tires on the map! You know what is funny Antonio? I added that Forsberg photo just for you because I was like that is Antonio style!